Here we are with the ribbon layouts produced by the Design Team in response to the ribbon challenge. 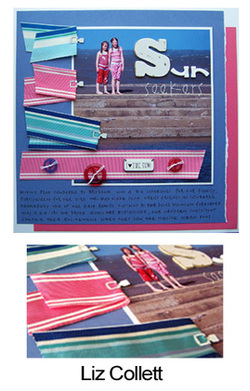 Caz has layered Strano Designs ribbon behind a letter stencil, giving the stencil a colourful and textured appearance. 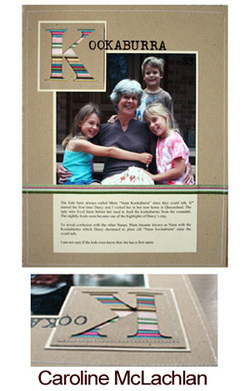 This is a great way to tie the colours in your photos into an accent for the page. Nic has used Li'l Davis ribbon and ribbon rings, and threaded the ribbon in belt-like fashion, attaching the ribbon rings to the ribbon with brads. 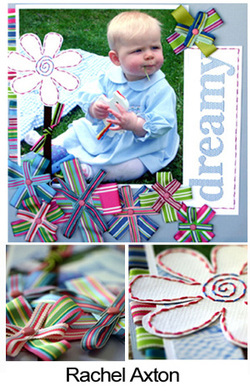 She has also attached small colourful strips of ribbon to the layout with double sided tape. Suz has used SEI ribbon from the Granny's Kitchen range and has attached it to her layout by machine sewing down the centre of each ribbon strip. 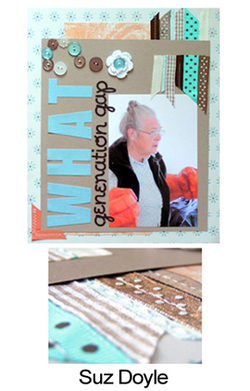 Liz has used extra wide ribbon from Strano Designs, attaching it to her layout with Heidi Swapp slide clips. Wide ribbon is all the rage at the moment and Strano Designs has some beautiful designs perfect for adding a big splash of colour to your creations. 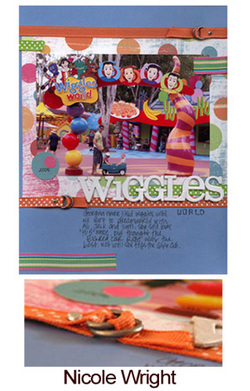 Rachel has incorporated Scenic Route twill tape into her layout. She has created a unique handmade flower accent by stapling small strips of twill in a circle and then machine stitched the stem and leaves. 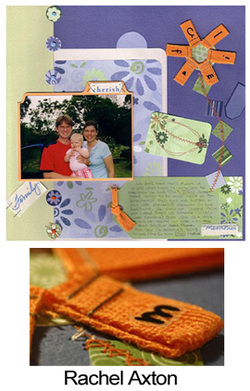 Rach has also used rub-ons on the twill to create the title for her "family" page. In her Fun in the Sun layout, which was run as one of the first series of class kits that we put out when we launched the program, Rachel demonstrates how effective tying and cramming ribbon can be. 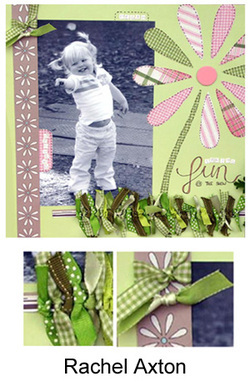 In the final layout, Rachel has used a smorgasbord of Strano Designs ribbon to create these gorgeous flower accents and attached them to the page with brads. She has used more ribbon for the stem and leaves of the sewn flower.